The new Seahawks and Sounders special design plates are popular with drivers – with 5,800 Seahawks plates purchased since they became available earlier this month. What you may not know is a lot of coordination goes into developing a new license plate design. Non-profit organizations use special design plates to raise funds for their programs. The Department of Licensing works with these organizations to ensure the proposed plates meet DOL standards. Our job is to make sure the specialty plates work for toll collection. When preparing to launch tolling on SR 520, we were presented with a unique situation. We couldn’t use bright lights to take photos of the vehicle license plates crossing the bridge because the light would impact drivers, residents and even the aquatic life in Lake Washington. Instead of using bright lights, our toll system uses black and white cameras with an added blue filtered strobe light to capture good images of the license plates. 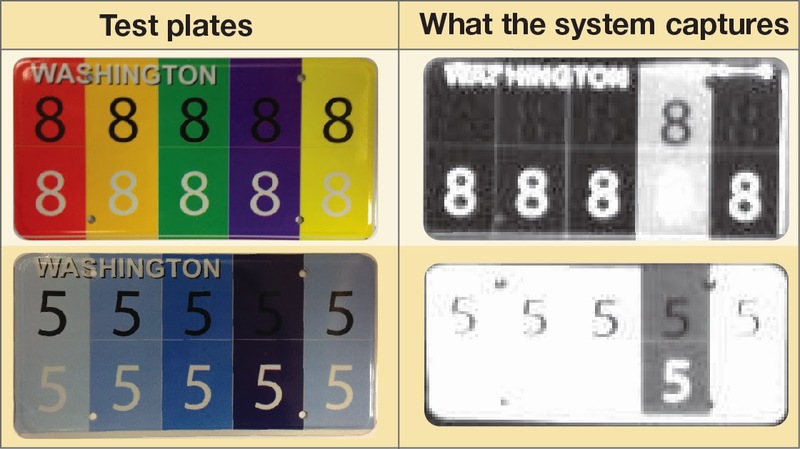 The blue filtered light allows blue portions of the plate to display as white and nearly every other color on the license plate appears as a shade of gray. This helps decrease the appearance of graphics in the background. For example, the light blue image of Mount Rainier on the Washington plate is basically eliminated, making it easier to read the letters and numbers on the plate. While the blue filter has many benefits, it also creates challenges with the contrast of colors and background for some specialty plates. In an effort to learn more about the challenges, we worked with DOL to develop test plates using a variety of color combinations. We put the test plates on a car and drove it across the SR 520 bridge. And yes, we paid the toll! After the test, we found we needed to make adjustments to the background of the new specialty plates to increase contrast. For example, one of the test plates had a blue background with white numbers. The blue filtered light made the blue background appear white, making it difficult to read the white numbers. We used what we learned with the test plates when developing the new Seahawks and Sounders plates. With a few minor color changes, we have a final product that works for our agency, DOL, law enforcement and the fans. The specialty plate guidelines we are developing with DOL will make it simple for organizations to design their specialty plates. The work will ultimately improve customer service by making it easier for the tolling equipment to accurately identify the license plates and ensure tolls are collected. This entry was posted on Thursday, January 30, 2014 at 9:44 AM and is filed under blue filtered strobe, license plate, license plates, seahawks, special design plates, SR 520, sr 520 bridge, Tolling. You can follow any responses to this entry through the RSS 2.0. You can leave a response.